Colorful flowers are a favorite for any occasion. 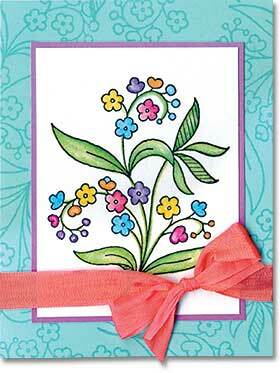 Stamp the Sweet Fleurs image onto a Lagoon Notecard with Soft Pool ink. Clean the stamp and ink with black ink. Stamp onto a white panel. Color the image with pencils. Back the panel with a Wisteria Notecard and trim. Affix to the card. Add ribbon tied in a bow. Cut a slice into the spine of the card to thread the ribbon through.